Today I’m very happy to share my recent interview with my friend and mentor Donna-Marie Cooper O’Boyle. 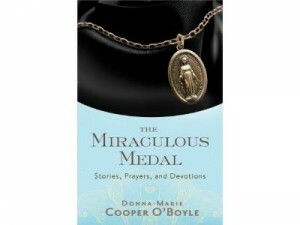 We congratulate Donna-Marie on the release of her newest book, The Miraculous Medal: Stories, Prayers and Devotions. Enjoy! Hello, Lisa. Thank you very much for your interest and this interview. I am a Catholic wife and mother of five children on earth and three in heaven. I strongly desire to help others get to heaven (which is something our Lord calls us all to take part of), and, so, with God’s grace, I strive to spread inspiration, encouragement and God’s love everywhere I go. Q: You are such a prolific author, and I know personally that much of your work began with the inspiration of Our Lady, Blessed Mother Teresa and a Miraculous Medal. What prompted you to write this particular book? Thank you for your kind words, Lisa. Yes. When I was on complete bed rest during a precarious pregnancy in which I had a hemorrhaged uterus and a heart condition, Mother Teresa, whom I knew at the time, sent me a blessed Miraculous Medal to wear, telling me to call upon Mother Mary in my need. She said to pray, “Mary, Mother of Jesus, be a Mother to me now.” She told me to wear the Miraculous Medal and assured me that the Blessed Mother would help me. The unborn baby that the doctor said would be miscarried is now twenty-two years old today! During that difficult pregnancy, I felt very inspired to write for expectant mothers, mothers, and families. It just poured out of me. I envisioned a pregnancy as a nine-month novena of prayer to our Lord and wanted to create a prayer journal for the expectant mother. Some of the thoughts and prayers I wrote down on paper for mothers and families during my sojourn of complete bed rest on my couch or my bed have been later published into books. One of the books is: Prayerfully Expecting: A Nine Month Novena for Mothers to Be. Mother Teresa ended up writing the Foreword! What prompted me to write this book: The Miraculous Medal: Stories, Prayers, and Devotions? I have a strong devotion to Our Lady of the Miraculous Medal and have seen and experienced some amazing things associated with this blessed sacramental. The inspiration came to me to write about the history of the Miraculous Medal, as well as to tell about many modern-day stories in an attempt to, in a sense, stoke up the embers of this marvelous devotion (which I think may have waned over time) and to pray that a brilliant and tremendous fire of devotion will come about in the hearts of the faithful, as well as in those who are not familiar with the medal too. Q: For those who consider the Miraculous Medal to be superstitious or without impact, please share briefly on the Church’s teachings about sacramentals. Sure, I’d love to explain the Church’s teaching on sacramentals, Lisa. The Miraculous medal and other sacramentals from our Church are not superstitious in any way, nor are they lucky charms—quite the contrary. In Sacrosanctum concilium (# 61), we learn, “For well-disposed members of the faithful, the liturgy of the sacraments and sacramentals sanctifies almost every event of their lives with the divine grace which flows from the Paschal mystery of the Passion, Death, and Resurrection of Christ. From this source all sacraments and sacramentals draw their power. There is scarcely any proper use of material things which cannot be thus directed toward the sanctification of men and the praise of God. Q: How had the Miraculous Medal and Our Lady’s intercession personally touched you? I wear the Miraculous Medal that dear Mother Teresa gave me during my difficult pregnancy with my daughter, Mary-Catherine. I never take it off. Prior to that, I wore others that Mother Teresa had given me or when in my youth—the medals which were given to me as gifts. I wear the Miraculous Medal because I want to please Mother Mary and receive her protection and the many graces she promises to those who wear her medal. I believe that she constantly blesses me with her amazing graces, as the Mediatrix of all graces. I believe that Mother Mary has been protecting me and guiding me ever closer to her Son Jesus. I am so touched by her grace and love that I want to share the blessings with others, and so I give out countless (thousands upon thousands) of blessed Miraculous Medals to people I meet—complete strangers and others I know, and those who have special needs. I also send out a blessed Miraculous Medal with every book order. Q: What would you hope that our readers get out of their experience of reading this book? I hope that their hearts will be touched in a profound way and that a beautiful devotion to Our Lady of the Miraculous Medal will be born in their hearts and souls and flourish as they continue to make their way, closer to the Blessed Virgin and Immaculate Mary’s Son, Jesus. Readers can find me (and my books, CD’s and DVD’s) at my website: www.donnacooperoboyle.com. I encourage them to subscribe to my email newsletter (through my website and blogs) so that they can receive continual inspiration and information about my books, talks, events, and pilgrimages. Readers can see me on EWTN’s “Women of Grace” special Live show which was presented at the EWTN’s Family Celebration in Birmingham, AL on Saturday, August 24th at 4:00 PM ET and at 6:30 PM ET, Saturday, Aug. 31st exclusively on EWTN. Find EWTN at www.ewtn.com/channelfinder. My new series, “Catholic Mom’s Café” will air sometime in the near future. I hope readers will tune in to it for inspiration and the Catholic tools to navigate life. Thank you for this opportunity, Lisa. Let’s together pray for one another and for every reader—we are all in this together on this exciting and profound journey to Eternal Life!